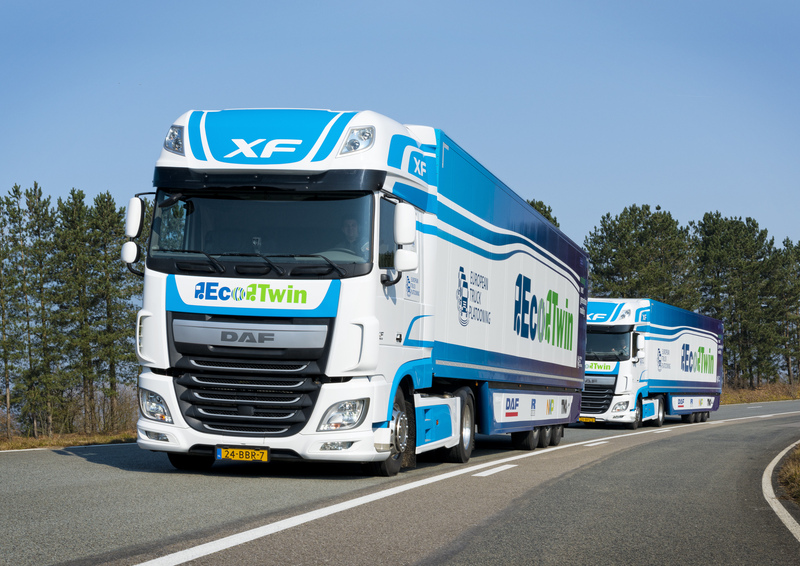 EcoTwin participating in the European Truck Platooning Challenge - DAF Trucks N.V.
A consortium of DAF Trucks, TNO, NXP and Ricardo is uniting under the name EcoTwin to participate in the European Truck Platooning Challenge that is being organised by the Dutch Ministry of Infrastructure and the Environment on Wednesday 6 April. The objective of the Challenge is to obtain permission from governments to perform large-scale, pan-European testing of truck combinations that are linked wirelessly (‘platoons’). This enables truck combinations to drive very close to each other, which presents benefits in terms of fuel consumption and therefore CO2 emissions, safety and the flow of traffic. Truck Platooning involves trucks driving a short distance apart using automated driving technology. 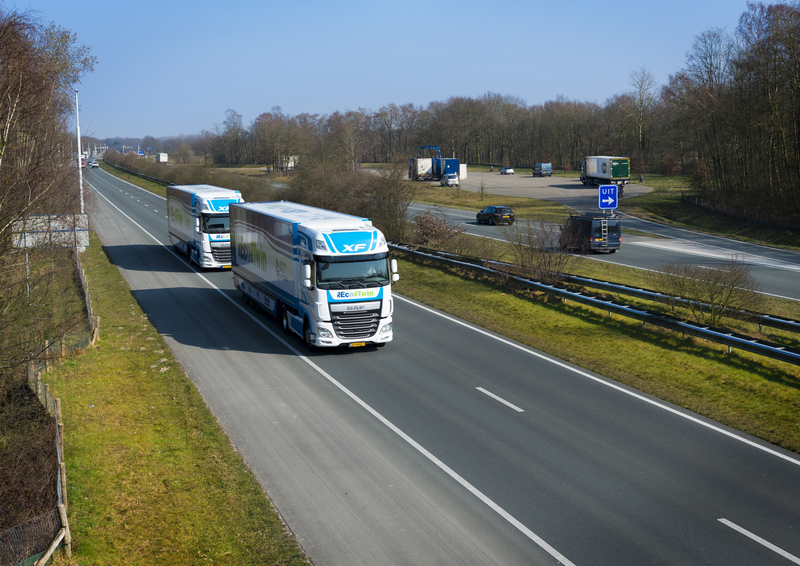 The Truck Platooning Challenge will demonstrate that a second vehicle is technically capable of automatically following the combination ahead using Wifi-P, radar and cameras. Within the context of the ‘EcoTwin’ project, it has already been demonstrated that the second vehicle is also capable of steering automatically. However, the emphasis during the Truck Platooning Challenge will be on autonomous acceleration and braking. In this regard, the planned distance between both combinations is 0.5 seconds, which at a speed of 80 kph approximates to a distance of 10 metres. One unique aspect of the ‘EcoTwin’ combination is the advanced Wifi-P connection, developed by NXP and specially designed for automotive applications. The rapid speed of the communication enables both DAF trucks to drive even closer together. Furthermore, Wifi-P allows the drivers of the ‘EcoTwin’ combinations to communicate with each other while driving. Everything that the driver in the first truck sees in front of him is projected onto a screen in the second truck (‘See Through’). By reducing the gap between truck combinations as far as possible and making the most of slipstreaming, fuel savings of up to 10% can be achieved in future, along with equivalent reductions in CO2 emissions. Furthermore, Truck Platooning will further enhance traffic safety, thanks to the combination of Wifi, radar and camera systems. Another benefit is the further improvement to the flow of traffic, because ‘platooning’ trucks will not overtake each other. Moreover, technologies are being developed that will enable passenger vehicles to join the traffic or leave the motorway safely and responsibly. 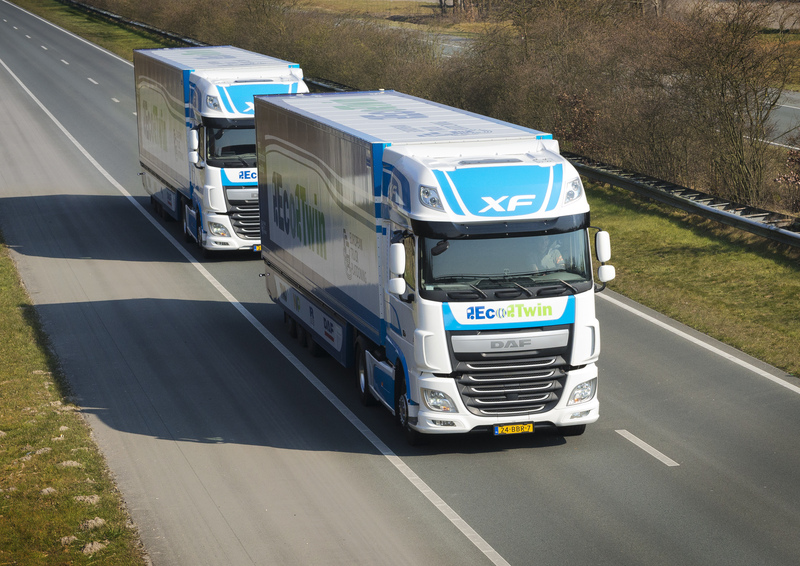 "It goes without saying that there is still a lot of continued development required before we can introduce platooning as a new technology on the market", says Ron Borsboom, member of DAF Trucks' Board of Management and responsible for product development. "This is definitely not a process that will be complete before 2020. There is still a great deal that has to be sorted out in terms of legislation, liability and acceptance. 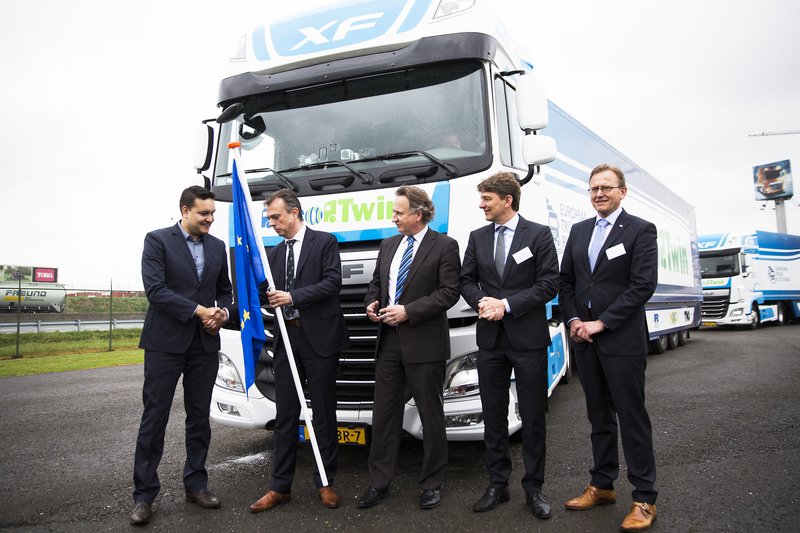 In conjunction with TNO, NXP and Ricardo, we will be demonstrating during the European Truck Platooning Challenge that truck platooning is technically possible. This demonstration should pave the way for truck manufacturers to be allowed to carry out further testing of the technology on public roads in order to acquire even more experience. It is now up to politicians to make this possible." 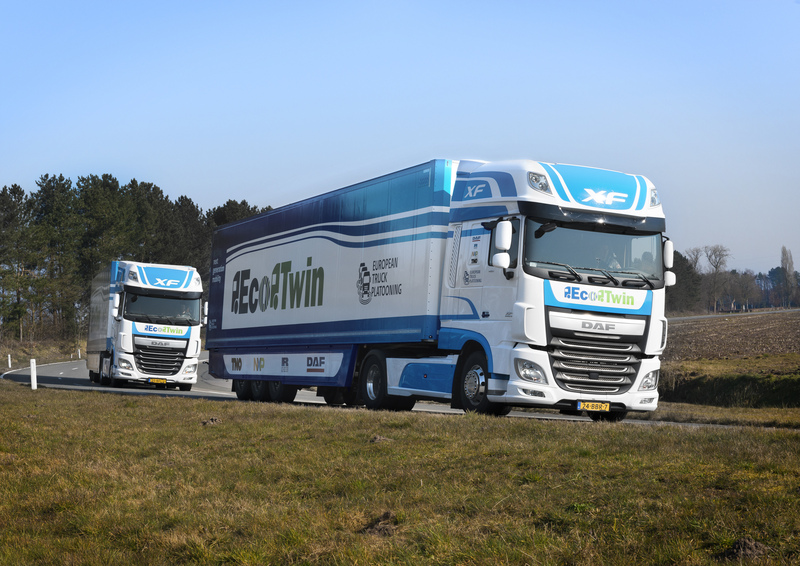 ‘EcoTwin’ is a consortium comprising DAF Trucks, TNO, NXP and Ricardo, with each party contributing its own specific knowledge and experience. NXP is taking care of the wireless, state-of-the-art communication system between both vehicles through the use of cameras, sensors, radar and Wifi-P. As a leading consultancy firm, Ricardo is providing advice in terms of the functional safety of the systems. TNO is contributing to the complete concept, the software and the synergy of all new technologies. In addition to the integration of all systems in the vehicles, DAF Trucks is taking care of all testing activities.